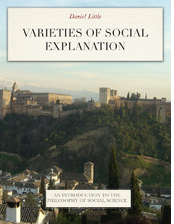 Understanding Society: Supervenience of the social? I have found it appealing to try to think of the macro-micro relation in terms of the idea of supervenience (link). Supervenience is a concept that was developed in the context of physicalism and psychology, as a way of specifying a non-reductionist but still constraining relationship between psychological properties and physical states of the brain. Physicalism and ontological individualism are both ontological theories about the relationship between higher and lower levels of entities in several different domains. But neither doctrine dictates how explanations in these domains need to proceed; i.e., neither forces us to be reductionist in either psychology or sociology. Analogously, to say that the "social" supervenes upon "the totality of individuals making up a social arrangement" seems to have a superficial plausibility, without requiring that we attempt to reduce the social characteristics to ensembles of facts about individuals. The causal properties of organization X supervene on the states of the individuals who make up X and who interact with X. There seem to be quite a few problems that arise when we try to make use of this idea. (a) First, what are we thinking of when we specify "the states of the individuals"? Is it all characteristics, known and unknown? Or is it a specific list of characteristics? If it is all characteristics of the individual, including as-yet unknown characteristics, then the supervenience relation is impossible to apply in practice. We would never know whether two substrate populations were identical all the way down. This represents a kind of "twin-earth" thought experiment that doesn't shed light on real sociological questions. The causal properties of a psychological process supervene on the functional properties of the states of the nerve cells of the corresponding brain. The nerve cells may differ in other ways that are irrelevant to the psychological processes at the higher level: they may be a little larger or smaller, they may have a slightly different content of trace metals, they may be of different ages. But our physicalist claim is generally more refined than this; it ignores these "irrelevant" differences across cells and specifies identity among the key functional characteristics of the cells. Put this way, the supervenience claim is an empirical theory; it says that electrical properties and network connections are causally relevant to psychological processes, but cell mass and cell age are not (within broad parameters). (b) Second and relatedly, there are always some differences between two groups of people, no matter how similar; and if the two groups are different in the slightest degree -- say, one member likes ice cream and the corresponding other does not -- then the supervenience relation says nothing about the causal properties of X. The organizational features may be as widely divergent as could be imagined; supervenience is silent about the delta to epsilon relations from substrate to higher level. It specifies only that identical substrates produce identical higher level properties. More useful would be something like the continuity concept in calculus to apply here: small deviations in lower-level properties result in small deviations in higher-level properties. But it is not clear that this is true in the social case. (c) Also problematic for the properties of social structures is an issue that depends upon the idea of path dependence. Let's say that we are working with the idea that a currently existing institution depends for its workings (its properties) on the individuals who make it up at present. And suppose that the institution has emerged through a fifty-year process of incremental change, while populated at each step by approximately similar individuals. The well-established fact of path dependence in the evolution of institutions (Thelen, How Institutions Evolve: The Political Economy of Skills in Germany, Britain, the United States, and Japan) entails that the properties of the institution today are not uniquely determined by the features of the individuals currently involved in the institution in its various stages. Rather there were shaping events that pushed the evolution of the institution in this direction or that at various points in time. This means that the current properties of the institution are not best explained by the current properties of the substrate individuals at present, but rather by the history of development that led this population to this point. It will still be true that the workings of the institution at present are dependent on the features of the individuals at present; but the path-dependency argument says that those individuals will have adjusted in small ways so as to embody the regulative system of the institution in its current form, without becoming fundamentally different kinds of individuals. Chiefly they will have internalized slightly different systems of rules that embody the current institution, and this is what gives the institution its characteristic mode of functioning in the present. So explanation of the features of the institution in the present is not best couched in terms of the current characteristics of the individuals who make it up, but rather by an historical account of the path that led to this point (and the minute changes in individual beliefs and behaviors that went along with this). Social structures supervene upon the states of individuals in the substrate described at a given level of granularity corresponding to our current theory of the actor. Small differences in the substrate will produce only small differences in the social structure. These add up to a strong claim; they entail that any organization with similar rules of behavior involving roughly similar actors (according to the terms of our best theory of the actor) will have roughly similar causal properties. And this in turn invites empirical investigation through comparative methods. As for the path-dependency issue raised in comment (c), perhaps this is the best we can say: the substrate analysis of the behavior of the individuals tells us how the institution works, but the historical account of the path-dependent process through which the institution came to have the characteristics it currently has tells us why it works this way. And these are different kinds of explanations. Is "soccer" an extended social thing?